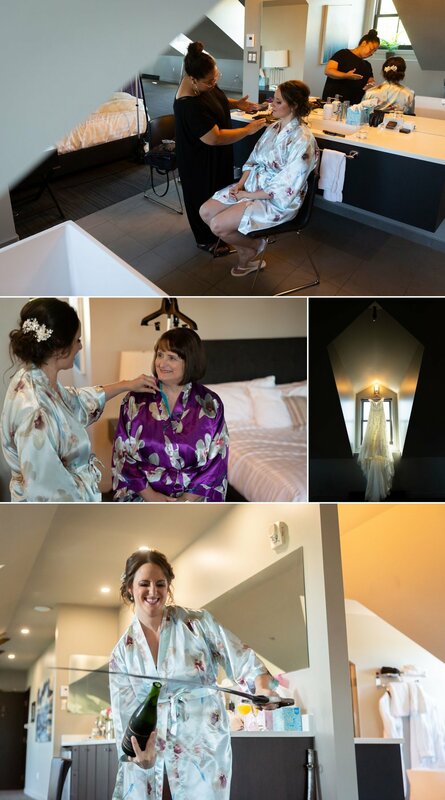 Our wedding day really was a dream come true and the culmination of a journey that started years ago when we both met for a magical first date at Soif, in Gatineau! At the time, Gabrielle was studying in Kingston and I was working in Gatineau. We were lucky to have taken a chance to meet, and we quickly fell in love. Since we were apart during the week, we quickly decided that we would always make the most of the time we were able to spend together. From road trips to Boston for a Pearl Jam concert, a quick weekend getaway to Disney, conferences in the States, and our first big trips in Japan and Iceland, we have found ways to get to know each other and make our relationship grow stronger. I proposed to Gabrielle on the day she came back from Kingston! We picked a travel-themed wedding to represent our passion for other cultures and our current living situation. Since our first date was in Gatineau and both our families live in the Ottawa region, we picked the Outaouais region to celebrate our nuptials. We were extremely lucky to have friends come from all over the world (from Moncton to Vancouver, and as far as Australia!) to attend our big day. We first met the Union Eleven team for a family photo session and we were immediately impressed by their talent, professionalism and personalized approach. From our engagement shoot to the wedding day, the Union Eleven team has been nothing short of amazing. We could not be happier about our wedding day and love the memories that are forever captured by these unique photos.